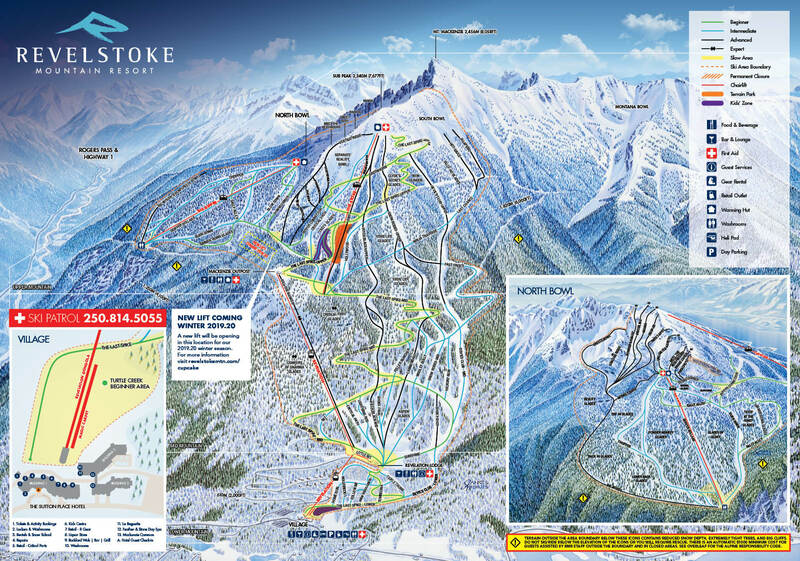 We use a number of different signs to indicate conditions, boundaries and warnings at Revelstoke Mountain Resort. Avalanche signage indicates areas prone to avalanche and areas closed for avalanche control work, potentially using explosives. This signage is typically present at the boundaries of our more advanced terrain and can indicate the terrain is either closed (red) or to ski with caution (yellow). Boundary signage is used in conjunction with ropes at the edge of our ski area boundary to indicate the area beyond which patrol and avalanche control work is not conducted. Cliff signage is used on ungroomed terrain to indicate areas where skiing is not possible without mandatory air. We have large cliffs within the area boundary, and size is not indicated on these signs. Use caution, or you could find yourself cliffed out. Slow signage is used in high traffic areas. If you see this sign you must reduce your speed to the average speed of those around you and keep your skis or snowboard on the ground. Failure to do so may result in confiscation of your lift ticket or pass. Winch cat warning signage is posted on the mountain after hours on runs where winch cats are conducting grooming work. The winch cat cable is an extreme hazard to skiers and snowboarders and can cause serious injury or death. We request that all backcountry users be aware of this signage and avoid runs where the winch cat is in use.